I love to go to Olive Garden and get their bread sticks and salad. Lately, I have been craving this goodness in my life! The closest restaurant is about 20 minutes away from my house, which is probably a good thing because I would be going more than I should. You can buy Olive Garden salad dressing in a lot of stores but nothing tastes as good as homemade, and then you have it on hand when you have a craving! Combine all the ingredients together in a blender. Blend until well mixed. 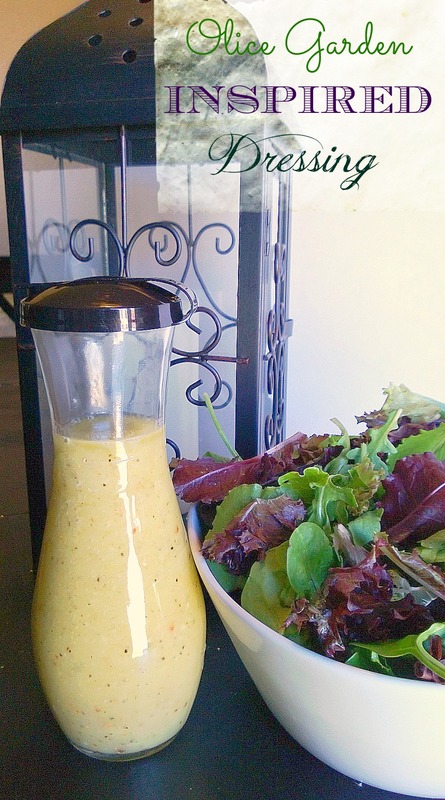 Pour into a dressing container. Allow to chill properly, at least an hour. Pour on salad and toss. You can use it on a traditional Olive Garden salad or any green salad of your choosing! Yum! I love Olive Garden's dressing. I will have to give this a try! I have always wanted this recipe! Thanks for joining Home Sweet Home! Sounds like a delicious dressing, can't wait to try it. Thanks for linking up at the Thursday Favorite Things Blog Hop.